So here’s Maida Heatter’s most popular recipe, according to Saveur magazine: Queen Mother’s Cake. 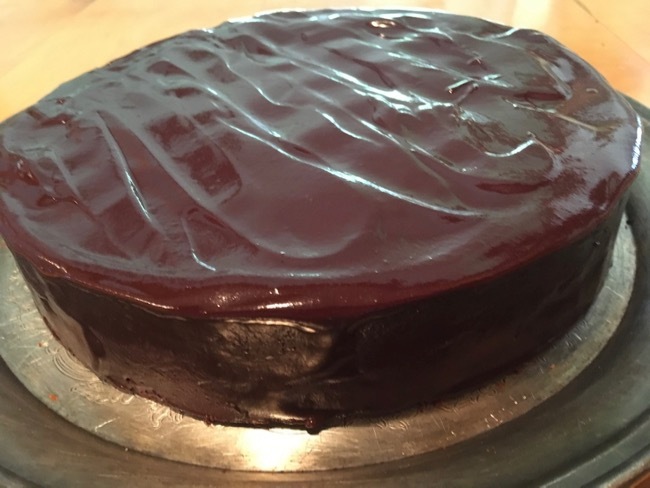 It’s a moist, light-textured, flourless chocolate cake made with finely ground almonds, butter, sugar, eggs, and semi- or bittersweet chocolate and glazed with a bittersweet chocolate ganache. Maida published the recipe in her first cookbook, “Maida Heatter’s Book of Great Desserts,” in 1974. If you search eBay for recipes of that decade, you’ll find them in the antique section. Does that make you feel old? Anyway, I’ve baked everything from Maida’s first cookbook, and let me tell you, she bakes this cake way too long and at too high a temperature. I can’t understand how this could happen because she’s an absolutely meticulous baker. Queen Mother’s Cake appears in several of Maida’s cookbooks, and the baking time and temperature are always off the mark. Why? I’ve searched the internet for different versions of the cake and I’ve found that the recipe itself is always the same but in a few cases times and temperatures have been adjusted downward from the original recipe. So I’m not alone in saying Maida Heatter bakes Queen Mother’s Cake at too high a temperature and too long! Just so you know, Maida’s instructions say to bake the cake at 375 degrees for 20 minutes and then to reduce the temperature to 350 degrees and bake for an additional 50 minutes. Total baking time is 1 hour and 10 minutes. I do start the cake in a 375 degree oven for 20 minutes, as Maida says, but then I reduce the temperature to 325 degrees and bake for an additional 30 minutes only. At that point the cake is fully baked and moist. The recipe itself has an interesting history. Maida got the recipe originally from a 1962 food column by Clementine Paddleford in The New York Herald Tribune. The story says that the Polish pianist, Jan Smeterlin, who loved to cook, collected recipes. 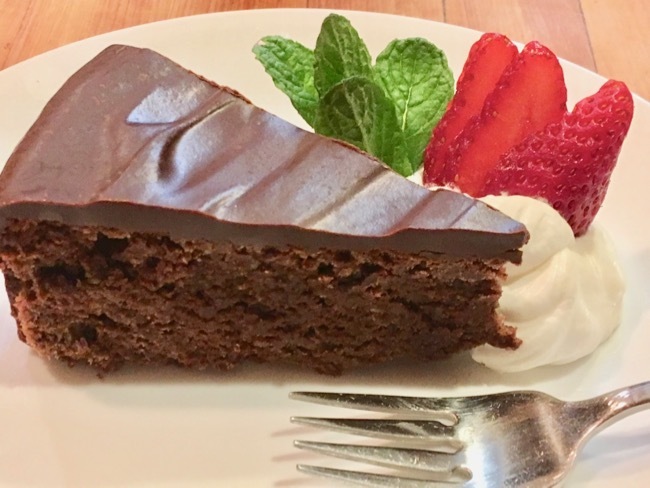 He got this chocolate torte recipe when he was on tour in Austria. When the Queen Mother came for tea at the home of some friends of the Smeterlins, the hostess served the cake made from the recipe Jan Smeterlin had given to her. Well, the Queen Mother loved the cake so much that she asked for the recipe and began serving it at her royal gatherings. And that is one version of how the cake got its name. When Maida first published the recipe, she said to grind the almonds with a nut grinder. 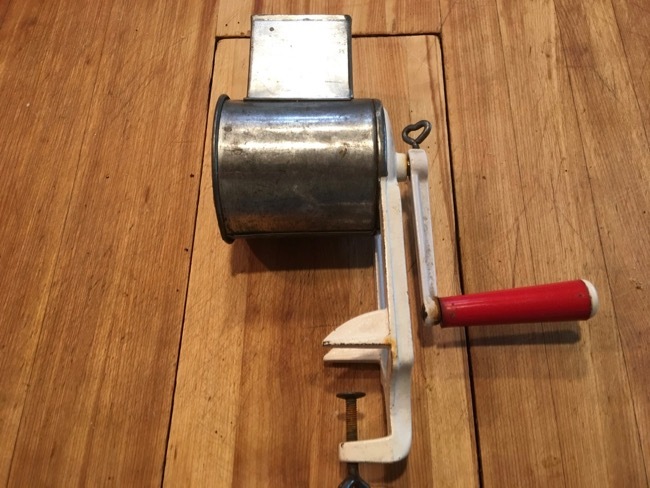 This nut grinder, which I bought in 1976, is fastened to a counter top or table with a screw (bottom of photo). You add the nuts to a hopper (top of the photo), crank the red handle, and out the side pour the ground nuts through the drum below the hopper. The ground nuts are powdery and flaky, and blend into batters with ease. Now here’s my problem with ground nut recipes today. Recipe authors say to grind the nuts with a food processor and to add some of the sugar to help the nuts along so that they won’t turn into a paste. But nuts ground this way are never powdery or flaky. They’re like tiny pebbles and they give cakes a gritty texture rather than a smooth one. Here’s a better solution. Buy almond flour or almond meal, the finer the grind the better, and use that instead. You can toast the flour or meal in a small skillet on medium heat, stirring constantly with a wooden spoon or heatproof silicone spatula, until golden brown and fragrant smelling. Scrape into a bowl to stop the cooking. When completely cool, add to the recipe. One final plea: Please weigh your ingredients! Serving of Queen Mother’s Cake. Here’s how I make Queen Mother’s Cake. This moist cake is delicious simply iced with a chocolate ganache or you can serve it with a spoonful of whipped cream and a few berries for a more festive dessert. I’ve added vanilla to the cake because in my way of thinking chocolate and vanilla just belong together. To make the cake, toast the almond meal or flour in a heavy medium skillet over medium heat, stirring constantly, until golden brown and fragrant. You should get a lovely aroma of toasted almonds. Transfer to a bowl and cool completely. Adjust a rack one-third up in the oven and preheat oven to 375°F. Butter the bottom and sides of a 9” x 3” springform pan and line the bottom with a round of baking-pan liner paper cut to fit. Butter the paper. Dust the pan all over with fine, dry bread crumbs and tap out the excess. Or, to make the cake completely gluten-free, dust the pan with unsweetened cocoa powder. Place the chocolate in a small saucepan. Heat about 1 inch of water in a medium skillet over moderate heat. When the water come to the simmer, set the saucepan in the skillet, cover loosely with a paper towel, and wait a few minutes until the chocolate is partially melted. Then uncover and stir with a small whisk or heatproof silicone spatula until the chocolate is just melted and smooth. Remove the pan from the water and set aside until chocolate is tepid or at room temperature. In a stand electric mixer beat the butter with the paddle attachment until soft and smooth. While beating on medium speed, gradually add 1/2 cup of the sugar (reserve the remaining 1⁄4 cup sugar) and the vanilla and beat to combine. Scrape the bowl and beater and beat 5 minutes on medium-high speed. Stop to scrape the bowl and beater twice. On low speed, add the egg yolks, one at a time, beating until smooth. On low speed add the chocolate and beat on medium speed until completely incorporated. Then add the almonds and beat on low until incorporated. Scrape the bowl and beater as necessary to keep the batter smooth. Now, the whites should be beaten in the mixer bowl. If you don’t have an additional bowl for the mixer, transfer the chocolate mixture to any other large bowl. Wash the bowl and beaters in hot soapy water. Dry them and they’re ready to for the egg whites. Beat the egg whites with the salt and lemon juice, starting on low speed and increasing it gradually. When the whites barely hold a soft shape, reduce the speed a bit and gradually add the remaining 1⁄4 cup sugar. Then, on high speed, continue to beat until the whites hold a straight point when the beaters are slowly raised. Do not overbeat. The whites should look creamy and hold a shape. When you tip the bowl the whites should not slide around in it. Stir a large spoonful of the whites into the chocolate batter to soften it a bit. Then, in three additions, very gently fold in the remaining whites. You’ll see traces of whites after the first two additions. Do not fold thoroughly until the last addition and do not handle more than necessary. Scrape the thick batter into the prepared pan. Rotate the pan briskly in order to level the batter. Wet and slightly wring out a folded towel and place it on a smooth surface. Remove the cake pan from the oven and place it on the wet towel. Let stand until tepid, 50 to 60 minutes. (Maida says she doesn’t know the reason for this step, but she always does it. I do, too). Release and remove the sides of the pan (do not cut around the sides with a knife—it will make the rim of the cake messy). Now, let the cake stand until it is completely cool, or longer if you wish. The cake will sink a little in the middle; the sides will be a little higher. Use a long, thin, sharp knife and level the top. Brush away loose crumbs. Place a rack or a small board over the cake and carefully invert. Remove the bottom of the pan and the paper lining. The cake is now upside down; this is the way it will be iced. Place 4 strips of baking-pan liner paper (each about 3” x 12”) around the edges of a cake plate. With a large, wide spatula, carefully transfer the cake to the plate; check to be sure that the cake is touching the paper all around (in order to keep the icing off the plate when you ice the cake). If you have a cake-decorating turntable or a lazy Susan, place the cake plate on it. To make the icing, scald the cream in a 5- to 6-cup saucepan over medium heat until it begins to form small bubbles around the edges or a thin skin on top. Add the espresso or coffee powder and whisk to dissolve. Add the chocolate and stir occasionally over heat for 1 minute. Then, remove the pan from heat and whisk or stir until the chocolate is all melted and the mixture is smooth. Let icing stand at room temperature, stirring occasionally, for about 15 minutes or a little longer, until icing barely begins to thicken. Then, stir to mix, and pour it slowly over the top of the cake, pouring it onto the middle. Use a long, narrow metal spatula to smooth the top and spread the icing so that a little of it runs down the sides (not too much—the icing on the sides should be a much thinner layer than on the top). With a small, narrow metal spatula, smooth the sides. Remove the strips of paper by pulling each one out by its narrow end toward you. This cake is wonderful all by itself. Just cut into portions with a sharp knife and set on dessert plate. Or place a spoonful of lightly sweetened whipped cream next to the cake and decorate with a few raspberries or, as I did in the photo, a sliced and fanned out strawberry.